Large areas of Brazil's rain forests are being burned to make way for homes, farms, and ranches. Tropical rain forests are located on both sides of the equator. The average temperature in a rain forest is about 25°C and doesn't vary much between day and night. Rain forests receive, on average, between 200 cm and 400 cm of rain each year. Tropical rain forests contain the highest diversity of life on Earth. Scientists estimate that there are about 30 million plant and animal species on this planet—and at least half of them live in rain forests! Tropical rain forests impact all of our lives every day. Plants in the forest remove carbon dioxide from the atmosphere and give off oxygen. Some of these plants are already used in medicines, and many more are being studied to determine their usefulness. This tropical rain forest in Costa Rica is untouched by human' development. Humans destroy as many as 20 million hectares of tropical rain forests each year. Farmers who live in tropical areas cut the trees to sell the wood and farm the land. After a few years, the crops use up the nutrients in the soil and more land must be cleared for farming. The logging and mining industries also contribute to the loss of valuable rain forest resources. Conservationists suggest a number of ways to protect the rain forests. • Have governments protect rain forest land by establishing parks and conservation areas. • Reduce the demand for industrial timber and paper. • Require industries to use different tree-removal methods that cause less damage. • Teach farmers alternative farming methods to decrease the damage to rain forest land. • Offer money or lower taxes to farmers and logging companies for not cutting down trees on rain forest land. Carrying out these plans will be difficult. The problem extends far beyond the local farmers—the whole world strips rain forest resources in its demand for products such as food ingredients and lumber for building homes. Present Prepare a multimedia presentation for an elementary class. 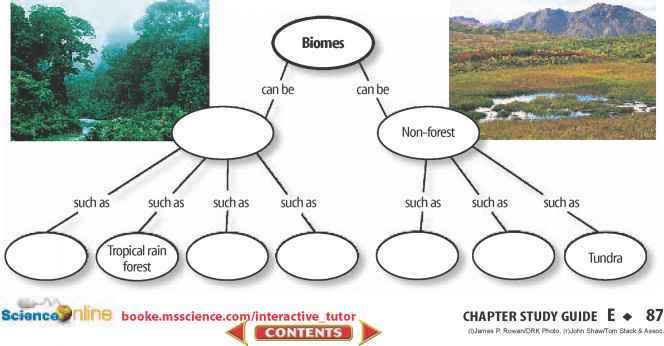 Teach the class what a rain forest is, where rain forests are located, and how people benefit from rain forests. A measure of biodiversity is the number of species present in an ecosystem. In general, biodiversity is greater in warm, moist climates than in cold, dry climates. Extinction occurs when the last member of a species dies. Habitat loss, pollution, overhunting, and introduced species can cause a species to become threatened or endangered. Global warming and ozone depletion could affect biodiversity. 1. Conservation biology is the study of methods for protecting Earth's biodiversity. 2. The Endangered Species Act of 1973 preserves biodiversity by making it illegal to harm threatened or endangered species. 3. Habitat preservation, habitat restoration, and wildlife management strategies can be used to preserve species. 4. 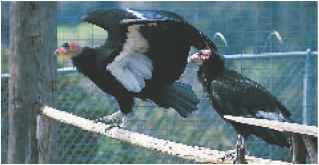 Reintroduction programs can be used to restore a species to an area where it once lived. 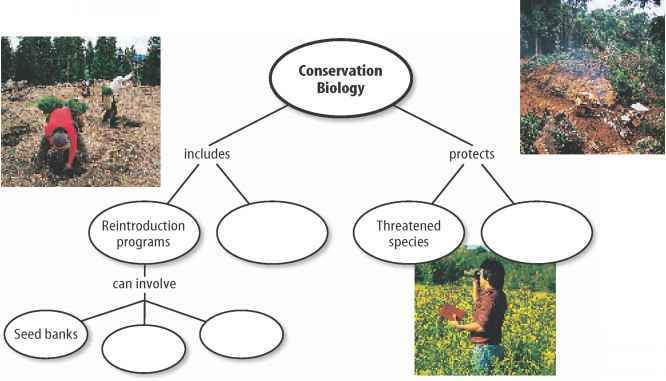 Copy and complete the following concept map using the following terms: habitat restoration, captive populations, relocation, and endangered species. Explain the differences in the vocabulary words given below. Then explain how the words are related. 10. Which state probably has the greatest biodiversity? 11. Which of these is the greatest threat to the Lake Erie water snake? 12. Which of the following gases might contribute to global warming? 13. Which of the following can reduce biodiversity? 14. Jen has a tank with 20 guppies. June has a tank with 5 guppies, 5 mollies, 5 swordtails, and 5 platys. Which of the following is true? A) June has more fish than Jen. B) June's tank has more biodiversity than Jen's tank. C) Jen has more fish than June. D) Jen's tank has more biodiversity than June's tank. 15. What would you call a species that had never lived on an island until it was brought there by people? 16. Which of the following conservation strategies involves passing laws to protect species? Use the photo below to answer question 17. Kenneth W. Fink/Bruce Coleman, Inc.
18. Infer What action(s) could people take to help reduce the types of air pollution that might contribute to global warming? 19. Describe what conservation strategies would most likely help preserve a species whose members are found only in zoos. 20. Draw a Conclusion Four designs for a road system in a national park are shown above. Which arrangement best would avoid dividing this habitat into pieces? Explain. 21. Infer Why might the protection of an endangered species create conflict between local residents and conservation biologists? 22. Explain why habitat loss is the most serious threat to biodiversity. 23. Concept Map Draw an events-chain concept map using the following terms: species, extinct species, endangered species, and threatened species. 24. Form a Hypothesis In divided wildlife areas, large animals have a greater chance of becoming extinct than other organisms do. Suggest a hypothesis to explain why this is true. 25. Compare and Contrast Explain how legal protections and wildlife management are similar and different. 26. Recognize Cause and Effect Design a wildlife management plan to allow deer hunting in a state park without damaging the ecosystem. 27. Poster Use images from magazines to create a display about how humans threaten Earth's biodiversity. Use the following table to answer questions 28-30. 28. Habitat Loss Use the data in the table to make a bar graph. 29. Original Habitat Using the table above, calculate the beginning amount of habitat in each country. 30. Remaining Habitat Use the table above to calculate the proportion of wildlife habitat area remaining in Ethiopia, Vietnam, and Indonesia. 31. Extinction Since 1600, the number of known extinctions includes 29 fish, 2 amphibians, 23 reptiles, 116 birds, and 59 mammals. How many vertebrates are known to have gone extinct since 1600? 32. Biodiversity A pond contains 6 species of fish, 3 species of amphibians, and 2 species of reptiles. A new species of fish is released into the pond resulting in the loss of 2 fish species and 2 amphibian species. How many species are in the pond before the new species of fish is released and how many species are in the pond after it is released? 33. Introduced Species After the brown tree snake was introduced to the island of Guam, 9 of 11 native forest-dwelling bird species became extinct. What proportion of native forest-dwelling bird species remain? Use the illustration below to answer questions 1 and 2. 1. A road is being built through an area near two lakes and a construction team must chose between Plan A and Plan B. A conservation biologist evaluates how each plan would affect biodiversity in the ecosystem that includes the lakes and urges the team to follow Plan A. Why? A. It introduces new species. B. It does not divide the aquatic habitat into small areas. C. It makes the road easier to drive along and view animals. D. It helps keep more water in both of the lakes. 2. Which species is least likely to be affected if the construction team follows Plan B? 3. Where would you expect to find more biodiversity? Test Day Preparation Avoid rushing on test day. Prepare your clothes and test supplies the night before. Wake up early and arrive at school on time on test day. 4. What is used to link small parks together so animals can move easily from one to another? 5. How does Earth's ozone layer protect living things? Use the illustration below to answer questions 6 and 7. The small mollusks shown above are zebra mussels, a native species in the Caspian Sea in Asia. They were accidentally brought to the Great Lakes in the ballast water of boats. How would zebra mussels be described in North America? Zebra mussels grow more rapidly than mussels native to the Great Lakes and cause the native mussels to die out. Which of the following best describes the problem caused by zebra mussels? A. They are decreasing biodiversity. B. They are causing divided habitats. C. They are polluting the water. D. They are causing global warming.